It is impossible to fairly judge the Nintendo 3DS, the next hot thing from the people who brought us the Wii, until you see it in person. I've seen it — I've played it — in June, in October and again this week. The results are mixed; the surprises are plentiful. On Wednesday I played more than a dozen 3DS games. At times, I played with the system's 3D slider off, as if I was just playing standard two-screen DS portable video games running on a machine that has enough muscle to display an attractive version of a cutting-edge home Street Fighter game. As often as I could, though, I slid the machine's 3D slider up to see the system's vaunted feature: Avatar-style 3D imagery, viewed without the need of special glasses. I shot tons of video of the games. You can see how powerful the 3DS is for yourself, but you can't see the glasses-free 3D. It's not been surprising that I've been poked with questions on Kotaku, over Twitter and in person about whether the 3DS is worth it. Is it any good? Does the 3D work well? Does it add anything? Did it make you ill? I'd been failing in the analogies I use to describe the 3DS' glasses-free 3D effect to people. I thought I had a good one: compare looking at a video of a fish-tank to looking at an actual fish-tank. That's close to what the 3DS effect is like. If you look at a game's graphics running on the 3DS' top screen with the 3D slider pulled down, you see standard flat graphics; sliding it up does create the illusion that the game's background has been pulled an inch or two further away, as if it's hovering beyond the plastic backing of the 3DS' upper half. Characters stand in the middle of this unreal scene, like fish floating in the fish-tank. My analogy fails, however, because it doesn't convey how wonderfully expansive the 3D graphics appear to be. "Expansive" is an odd word for a screen that is just showing visuals at a few inches wide. I thought I was hearing nonsensical hype when one of the talking-heads Nintendo trotted out on Wednesday morning started talking about how the 3DS makes game graphics feel bigger. The talking head was right. I felt less like I was looking at a fish-tank and more like I was looking through a peephole to a broader world. I found the most expansive 3DS game graphics where I didn't expect to: in sports games. As the Wednesday 3DS event reached its later hours and I'd believed I'd seen the important, high-profile 3DS games, I decided to try EA's Madden football game and Konami's Pro Evolution Soccer. Neither is amazing when the slider is off. Pro Evo is a port of a PSP game; I don't know if Madden is even that technologically complex. But with both games, I slid the 3D slider up and saw great things. The playing field appeared to expand. It didn't just feel like the turf had receded further away from me. As I looked down at the football and soccer fields from what would, relatively speaking, be about 20 feet over the grass, I had the sensation of the game's landscape spreading beyond the lateral bounds of the machine that rendered it. I felt less like I was looking at a fish-tank (instead of a fish-tank photograph) and more like I was looking through a peephole to a broader world. The effect was magnificent. The effect also had zero impact on how either game played. Nintendo people have said that viewing a game in 3D will help players gauge the spatial relationships between characters and objects in 3D-rendered worlds. That might be true for one of the games that had troublesome 3D (more on that in the next section), but in the games I played that had the best 3D, the 3D was strictly visual garnish. And get this: it was visual garnish that I want to see again. I've played Killzone 3 in 3D on the PlayStation 3. I've seen movies in 3D. I don't miss the experience. I'm not rushing to buy a 3D TV for more of that Killzone or to activate a home Avatar 3D viewing. Yet just two days after playing games on the 3DS with the 3D on, I want to see (most of) them again. I think the difference is because of the equipment involved (cost of a new 3DS vs. cost of a whole new TV; no need to wear glasses vs. need to wear glasses). The difference is also because 3D on the 3DS presents no anxieties to me. If it acts up, I can just slide it off. If I want more, I'll just flick that slider up. As I hopped from game to game on Wednesday, I kept getting impressed by games I didn't expect to impress me. I discovered that games with limited background movement in them do the whole expansive-world effect of the 3D very well. Nintendogs + Cats, which was presented very simply, with just one puppy and one cat hanging out in an empty room, had welcome visual depth. Even better was Dead or Alive: Dimensions, a fighting game whose backgrounds seemed to push far beyond the plastic parameters of Nintendo's handheld. With both of those games, I kept my eyes on just the pair of key characters on the screen while the backgrounds receded beyond them. With the 3D turned off Ridge Racer 3D looked skippable. I've seen better-looking racing games on iPhone and PSP. But this game may have the best 3D of any 3DS game I've seen yet. It's nothing fancy; it's just a racing game with all of the depth of the tracks receding beyond the screen. Maybe it was the framerate, maybe it was the simplicity of seeing constant forward motion, but speeding through this game with the 3D on was a wonderful experience. When I've been thinking back to Wednesday's games, this is the one the continues to pop into my mind's eye first. It's unremarkable in 2D; utterly amazing in 3D. All is far less than perfect with the 3DS' 3D. On Wednesday, some of the games I had the highest hopes gave me some of my worst 3D experiences. Kid Icarus Uprising is graphically spectacular when the 3D slider is off. When I slid that slider up, no matter how I positioned it — adjusting the degree of 3D-ness of the graphics — I kept fracturing the solidity of the image. To see the 3D in any 3DS game, you have to maintain a stillness of hands and a consistency of focus that takes a half-second to biologically click in. It's neither hard nor annoying to maintain that focus on games like Ridge Racer or Nintendogs, but with Kid Icarus, I found that I continued to lose my focus. I literally kept seeing double as a result. I had the same seeing-double problem with Nintendo's Pilotwings Resort, the one game that showed a hint of gameplay-relevance to its 3D graphics. When I was able to maintain 3D focus, I was controlling a small plane, flying toward orbs floating in the sky and through rings that hovered beyond. The 3D helped me judge how far away each orb and ring was. But every five seconds or so, I'd lose focus and the rings would appear to double. I'd tinker with the slider, get a fix, and have it work for a few seconds more. I asked others about the double-vision problems. Some people said they'd seen it too on Pilotwings and Kid Icarus. Some said they'd seen it on the 3DS' The Legend of Zelda: The Ocarina of Time. I did not see it in Zelda. One of the strangest things about the 3D on Nintendo's 3DS is that you have to think about it. That is not the normal Nintendo experience. I talked to Nintendo people about it. They recommended holding the system more still (impossible; I hadn't been moving). Some said they'd long ago gotten used to keeping their focus on the 3DS. One who said he always gets headaches from other things promised me he'd never gotten a headache from the 3DS, despite more than a half-year of playing on the machine. It's impossible for me to deduce what the problem was. Is it my eyes? My brain? The games? The hardware? More importantly, will any of those things improve? Can any of them adapt over time to the 3DS experience. The 3DS has the advantage and disadvantage of that 3D slider. That feature renders 3D as merely optional for any 3DS game. That means that Kid Icarus and Pilotwings could be excellent games even if they are horrible in 3D. The temptation will be — the selling point is — to turn that 3D on. And there, so far, those games suffer. One of the strangest things about the 3D on Nintendo's 3DS is that you have to think about it. That is not the normal Nintendo experience. We all know how you press this button or that to make Mario jump or throw a fireball in Super Mario Bros. We know that some sort of motion sensor lets us swing our arm to play tennis in Wii Sports. Nintendo's victory has long been that we seldom consciously think about things like that. We forget about the machinery. We get lost in the experience. At a few tables on Wednesday, Nintendo was showing its AR games. AR stands for augmented reality, a technique others have used before Nintendo but perhaps not as well. Place a special card on a table, point the 3DS at it, and, on the screen of the 3DS, that table appears to sprout a fire-breathing dragon at which you can shoot as you walk around it (by walking around the table!). This all happens thanks to cameras and gyro sensors and other tech, but the experience is so good you don't think about it. You don't analyze the machinery. You don't dwell on the technology. You don't worry about whether this effect or that effect is turned on or off. The Nintendo 3DS will come with six augmented reality cards. But what does that mean? You forget the gadgetry and get lost in the game. That is not the 3DS experience when it comes to 3D. By design, the 3D is something you do think about. It is something you manage and tinker with. In most of the games I played on Wednesday, you think about it once and then it just works, works so wonderfully you keep thinking about Ridge Racer — Ridge Racer! of all things — two days later. When it doesn't, though, 3D on the 3DS feels like something of a hassle, something unusually inelegant for the kind of video game experiences Nintendo likes to present. 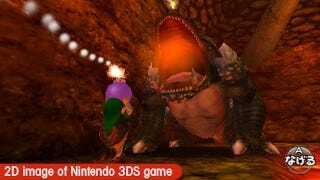 The 3DS still needs its game that makes us forget about the 3D effects while still loving the 3D effects. It needs its game that melts our awareness of the device away. It already has, however, the ability to convey a wonderful experience. You should see it, maybe after the machine launches in North America on March 27. With the right games, it looks great.